Firefox 4 is right around the corner, and the Firefox’s community and team are working their butts off to make it as awesome as possible. The blocker list is going down every day, and the browser’s looking better than ever. However, with everyone putting so much effort towards blockers, there are less people available to help with polish bugs for the add-ons manager. In particular, there’s a handful of bugs – mostly in CSS – that would take the add-ons manager from good to awesome. If you know CSS and are interested in helping with a feature used by millions, please consider taking a look at one of the remaining bugs. Not only will you be hailed as the people’s hero (by me anyway), but you’ll be helping millions of people customize their browsing experience. If you need any information or help, comment I’ll get in touch with you! One of the best reasons to use Firefox is with thousands of add-ons available to customize it, you can turn it into exactly the browser you want. To make it easier for you to find and use add-ons, members of the Firefox team and community have been working to redesign the add-ons manager for Firefox 4.0. The new add-ons manager will be easier to use, sleeker, and faster than ever before. 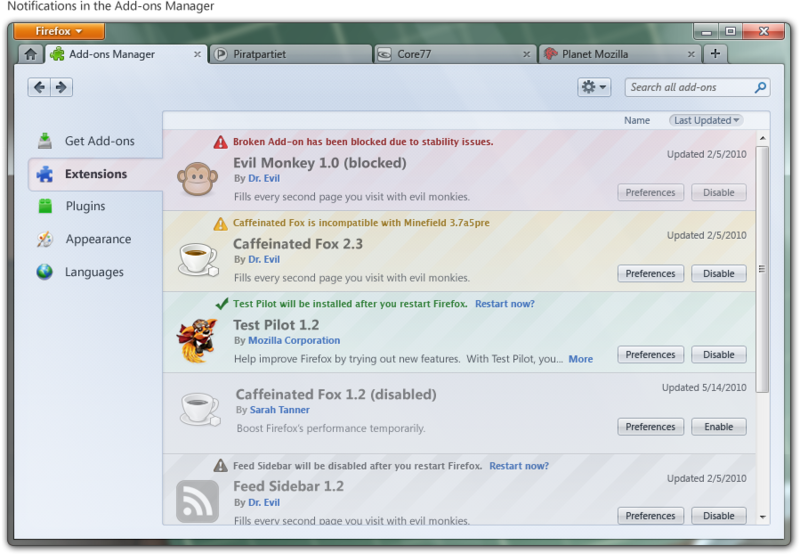 No more warnings when your add-ons are out of date; Firefox will now update them automatically. This should happen without you even noticing, keeping add-ons safe and fast while eliminating the hassle of updating. Restarting your browser is a pain. Developers can now build their add-ons for Firefox 4 such that no restart is required; add-ons built using the Add-on SDK get this for free. Restartless add-ons can be installed, modified, and removed without a single restart needed! More and more restartless add-ons are being created and made available on addons.mozilla.org every day. Instead of managing your add-ons in a small, separate window, the add-ons manager now loads in a tab. This means it won’t be so small and easily lost among other windows, and you can interact with it identically to other tabs, including resizing and moving. Justin Scott has been leading a project to create a new section in the add-ons manager we call the Get Add-ons pane. 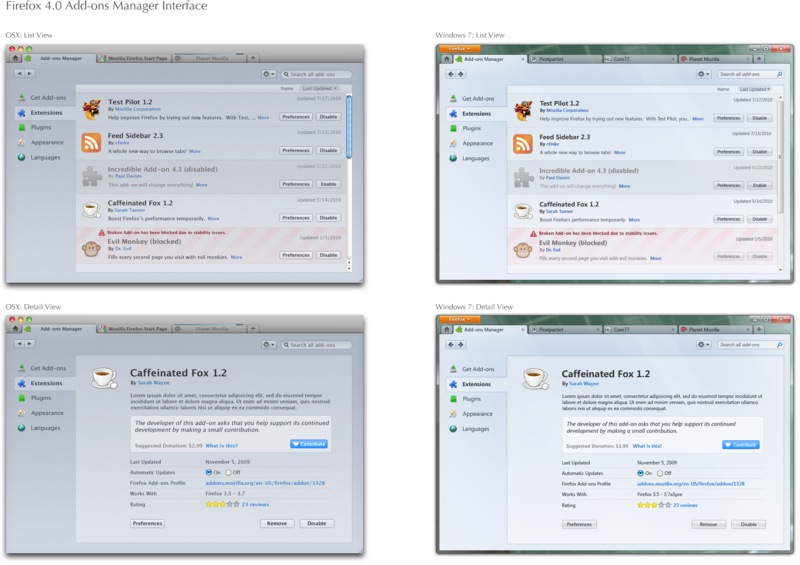 In the old add-ons manager, we displayed five featured add-ons that could be installed. This was done to show you some examples of add-ons – much like buying a picture frame with a stock photo already inside. Justin’s done a thorough revamp of Get Add-ons, building a page which introduces you to the concept of add-ons, highlights particular add-ons that are editorially selected, and helps you explore and discover other add-ons that match your interests. Justin’s currently working on a new feature for this pane which makes personal recommendations of add-ons you might enjoy based on which add-ons you already have installed. If you want to make a change to an add-on but don’t know which category it’s in, you can now simply search for it in the new global search box. The add-ons manager can quickly locate an installed add-on or find you some matching add-ons that are available to install. 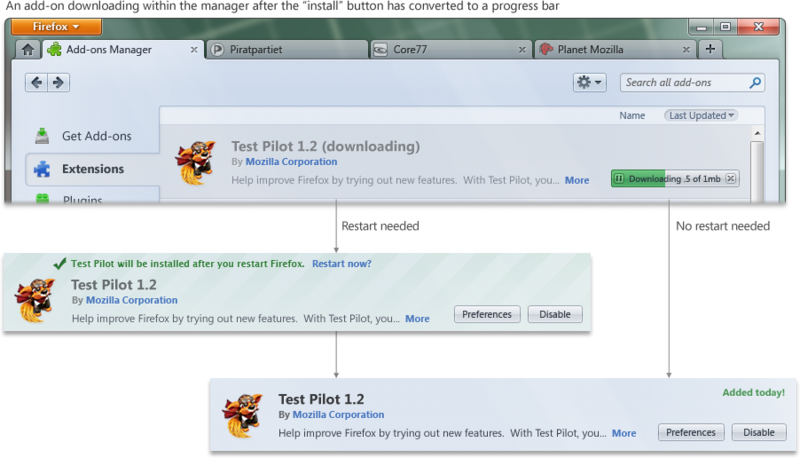 If you’re using Firefox’s nightly builds, you can already see many of the above changes in action. Blair McBride has recently put a lot of work into the new theme change, so now we’re working on the final few bugs and polish. If you’ve already used the new add-on manager, please share your thoughts by commenting or leaving a message on Firefox 4.0’s feedback page! 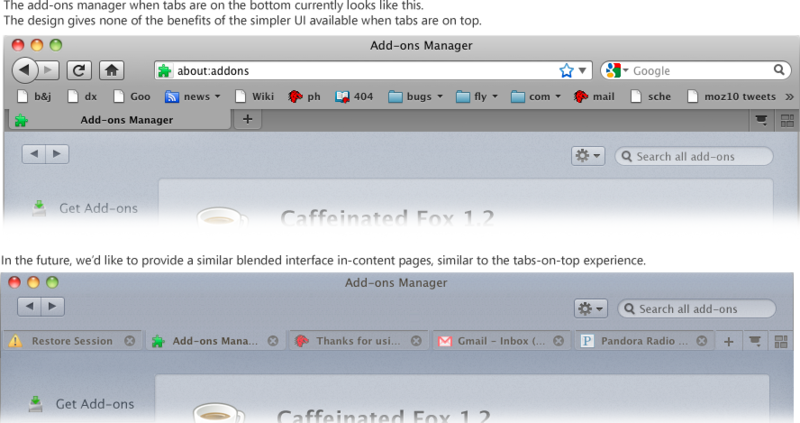 I’d like to give a few updates on the continued implementation of Firefox 4’s new add-ons manager. As development work continues, some parts of the manager’s functionality have been adjusted and updated since I last posted mockups. Here are a few highlights of what’s been going on. Each add-on in the manager could have one of several notifications that only pertain to itself. How can it be made clear when an add-on needs attention or action? Stephen Horlander first experimented with adding subtle coloring and diagonal stripes to each add-on. In the latest nightlies, this method is expanded to give the full range of add-on notifications. Red and yellow signify different levels of potential problems, while grey and green signify when an add-on requires attention or action. 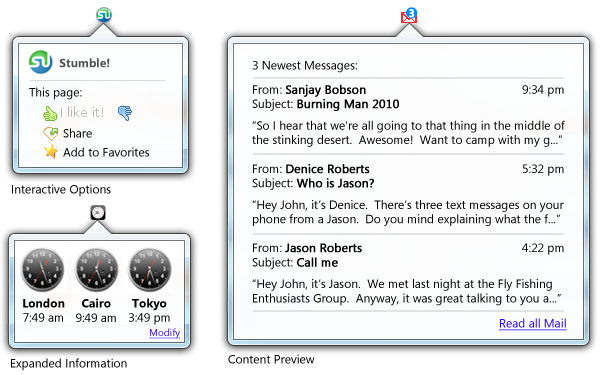 In Detail View, where only one add-on is visible, notifications appear at the top of the pane. Notifications that relate to all add-ons now display in the scope bar (bug 566194). The color of global notifications follows the same scheme as notifications for individual add-ons. Space in the navigation bar normally used for browsing buttons can be repurposed for widgets useful for in-page content. For instance, the URL bar space can be used in future Firefox versions to present breadcrumb navigation for in-page content. Progress towards removing browser navigation widgets is being tracked in bug 571970. 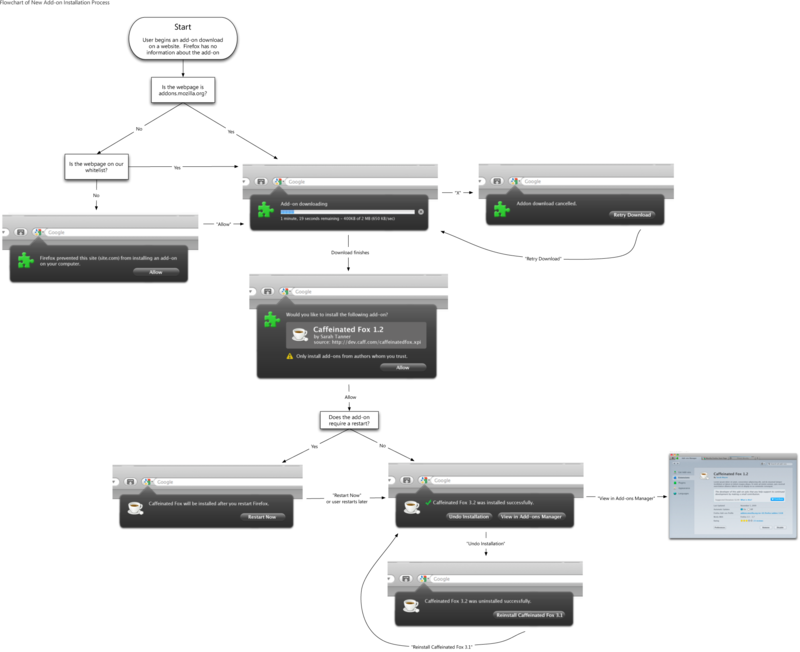 Unfortunately, this will only work when Firefox is in its default tabs-on-top mode. Removing elements for tabs-on-bottom configurations involves changing the entire theme of Firefox substantially. In order for fast tab switching to remain possible, tabs would need to remained aligned in tabs-on-bottom mode while still preserving the minimal style of in-content pages. This will be the goal for a future version of Firefox. If you run Firefox nightlies, you may have noticed that if you install an add-on from within the add-ons manager, the installation process happens fully within the manager. By turning the download button into a progress bar, the user’s focus need not move; the relevant information for the download is where the user was looking in order to prompt the download. After the add-on is downloaded, a notification will display on its entry alerting the user that either the installation is complete or that a restart is needed. A notification will appear over themes and backgrounds when they are fully implemented in the manager. These and other changes that only effect the style of themes and backgrounds will be implemented in future versions of Firefox after 4. We’ve also streamlined the process of installing an add-on from a website for Firefox 4. The new design uses Firefox 4’s new arrow notification panels to minimize the number of steps required. When the user begins an add-on installation, the download now begins automatically. For most users, this should only take a second or two. The user then sees the name, author, and source of the add-on, and has the option of allowing the installation of the downloaded add-on. Firefox only obtains this information about add-ons once they have partially downloaded, which is why the full information is presented after the download completes. Though the add-on file has already downloaded at this point, the file is not accessed unless the user allows it to be. If the add-on does not require Firefox to be restarted, that’s it: the add-on is activated as soon as the user clicks “Allow”. If it requires a restart, the user is notified that a restart is needed and the add-on is activated after the next restart. 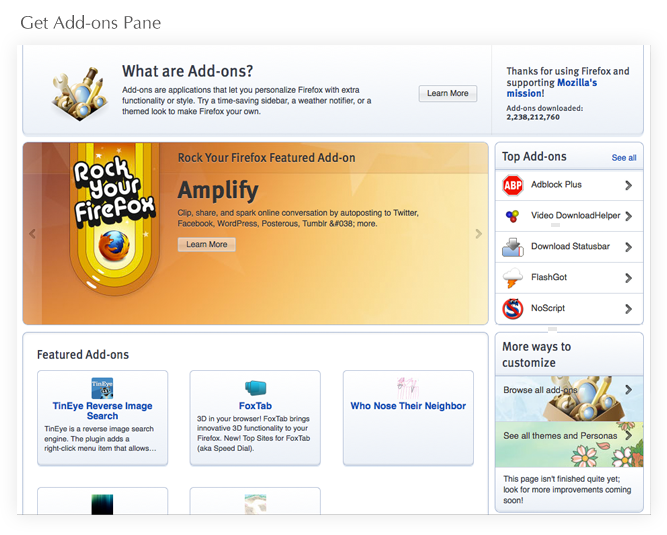 I’ve posted quite a few mockups on this blog of Firefox’s redesigned add-ons manager’s features and interactions. What I haven’t shown are screenshots of how the manager will actually look in Firefox 4.0. 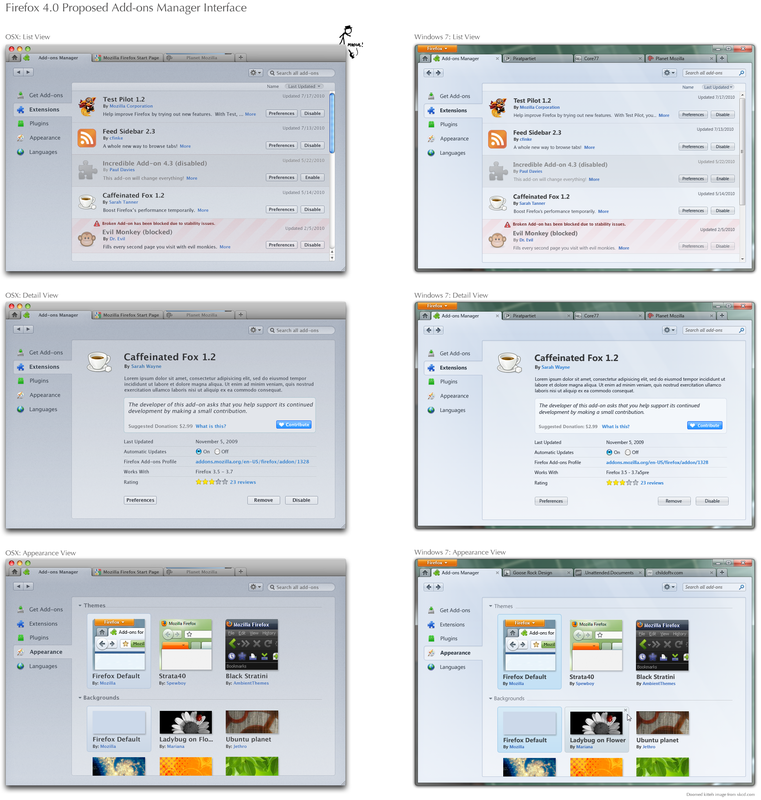 The following are designs, based on Stephen Horlander’s work on the new Firefox theme, of the add-ons manager in OSX and Windows 7. The icons are still placeholders, but the rest of the design is pretty near finalized. In the image below, you’ll see three windows for each operating system. The first row shows list view, where a short summary of each add-on and its description are shown. Buttons allow the user to disable an add-on or launch its preferences. Clicking “More” takes the user to detail view. The second row shows detail view, where the user sees more information about a single add-on. The full description is displayed as well as a contribution box if the add-on’s author chooses. Finally, appearance view shows installed themes and backgrounds (previously personas). Since these add-ons are primarily visual, the interface gives a large preview of each item and does not display a description. Dave Townsend and Blair McBride have been working hard on implementing these visual changes as well as the slew of under-the-hood improvements that are making the add-ons manager faster and more stable. To see how it’s coming along, try running a nightly build in your operating system of choice. Hope you like it! It’s World Cup month! Let’s start it out right. With another post about removing the status bar. I know I implied in my last post that you’d be free of this topic forever, but something was bothering me. A piece of the puzzle was missing. 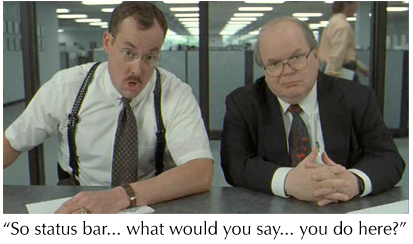 I talked it over with my skilled user experience cohorts last week. Whiteboards were involved. I think the kinks were worked out. The problem with putting add-on icons in the bookmark bar by default is that Firefox’s interface could become easily overcrowded if add-ons add more than just a 16 by 16 pixel icon. If an add-on creates a long horizontal widget, for instance, the whole bookmark bar could taken up after its installation. Also, many add-ons have come to rely on bottom-anchored functionality – partially because of the location of the status bar. Firebug, for instance, uses a status bar button because its interface is anchored to the status bar. When a user has no add-on installed, there is no status bar. As soon as the user installs one add-on that wants to use the status bar, a small bar appears in the bottom right of the Firefox window. It’s only long enough to accommodate the add-on icons and widgets the user currently has installed. If the user hovers over the status bar, a small arrow appears on its left. 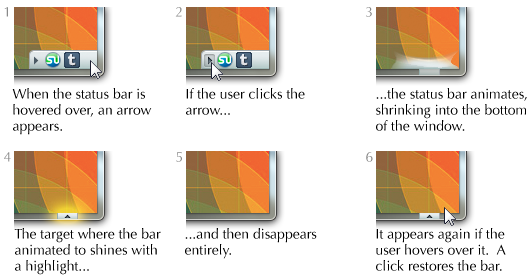 If the user clicks this arrow, the status bar shrinks into a small button in the bottom of the window. This button gives a faint glow as the status bar animates into it. If clicked, this button will bring the status bar into visibility again. The button is only visible if the user mouses near it, minimizing visual clutter. The benefit of this design is that only the smallest possible status bar is shown, and if the user prefers it can be entirely dismissed. The panels for rich interaction would still be added to the API, as well as a way for add-ons to identify themselves as acting on the current page content (perhaps via a subtle “glow” effect). I think this design addresses the multiple goals for add-ons in the ui: minimal disruption to current add-on functionality, minimal visual clutter, and trivial configuration if the user wishes to modify the default behavior. Recently, I wrote about Firefox’s status bar and how we’d love to remove it, relocate its functionality, and dedicate that area back to page content. Though many add-ons currently place icons in the status bar, these icons could be displayed elsewhere in Firefox’s user interface. By treating add-ons as UI elements that users can move within Firefox’s UI, the bottom of the browser window could be dedicated to content while the functionality of add-ons preserved. 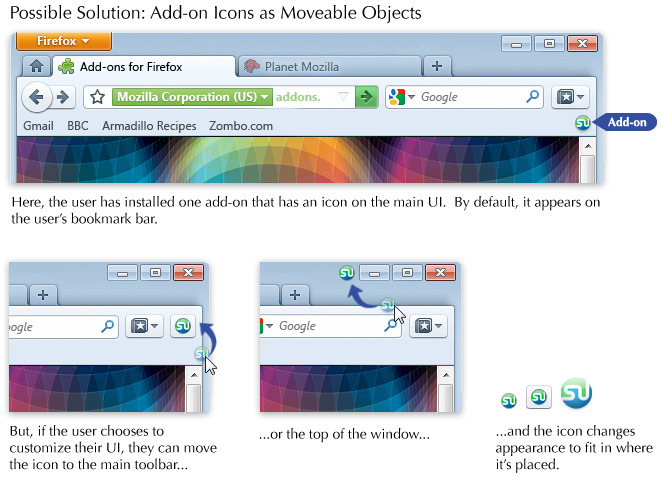 I proposed that by default, add-on icons display in the bookmark bar of the Firefox window. But, if the user wishes, he can move the add-on icons to other areas. Firefox can subtly change the appearance of an add-on icon to visually match where it is placed. Several commenters on my previous post noted that they preferred add-ons in the bottom right of the window, both because of particular add-on functionality and familiarity. Indeed, it should certainly be an option to reenable the status bar, and one way to do this should be to drag an add-on icon to the bottom of the window in customize mode. The cases that would be especially suited to enabling the status bar are add-ons that require long, horizontal space in the main UI. Especially newer add-ons built by Jetpacks are increasingly using this horizontal space in creative ways. If users want this kind of functionality, giving up a significant portion of the bookmark bar should not be the only way to achieve it. Firefox engineer Dietrich Ayala and Labs engineer Myk Melez are already at work to add an API to Jetpack that will allow these panels to launch from add-ons. One of the major goals in redesigning Firefox is presenting a simpler, cleaner, and smaller user interface. Firefox currently has more chrome (space taken up with user interface) than any of the major browsers, and all that chrome reduces screen space given to page content. We’d like to be more efficient with space in Firefox, maximizing the usefulness of the interface and the amount of content shown. The process of reducing Firefox’s chrome has meant looking critically at each part of the interface and how it’s being used. The goal is to find places where chrome can be minimized, both through efficient redesign and pure removal where functionality just isn’t providing enough benefit. This process led us to an obvious candidate for chrome reduction: the status bar. In addition to taking up page content, the status bar is the only part of Firefox’s permanent UI located on the bottom of the browser. This placement leads to the status bar being easily obscured, and sometimes requires resizing the window to view. For an entire toolbar of UI, it seems this slacker may not be pulling its weight in usefulness. 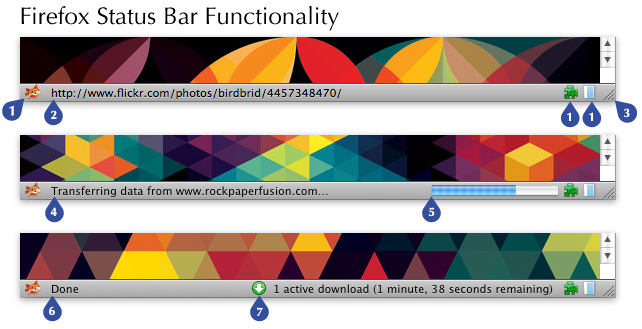 The status bar is home to a few pieces of functionality. However, with the new Firefox design, much of this functionality is already being relocated to the top of the browser. Other parts are not extremely useful. Already we can start crossing items off this list. #3, the window resize control, does not require a toolbar. #4, the currently loading task, is not widely useful; most messages display unintelligible processes which are flickered too fast to be read. #5, the progress bar, we’re already planning to move to the top of the browser, attached to the tab that is loading. #6, the “Done” announcement, should be handled in the negative: if the progress bar is gone, the page is done. #7, the download manager link, we’re also planning to move to the top of the browser. So, two pieces of functionality remain: add-ons icons, and link URL preview. Let’s look at add-ons first. Add-ons are tricky to plan for because developers can do whatever they want with them, and put them anywhere in the UI. Also, add-on icons in the UI can do anything, from affect page content to launch a menu. Unlike the other parts of Firefox’s chrome, we have no control over the function and placement of add-ons. The best we can do is provide a space for add-ons, recommend add-on developers take advantage of it, and give them tools to do so. An idea that’s been bounced around is saving the area to the right of the URL bar for add-ons. This is similar to what Chrome does. The benefit of this placement is that it doesn’t add any additional UI to Firefox. The problem is that while this works for one or two add-ons, the more icons the user installs, the smaller the space for the URL and search becomes. Heavy add-on users would eventually have to choose between not having all the add-ons they want or having less space to browse and search. A better solution would be useful both to users who have only a few add-ons and users that have many. One way we could handle this is by considering add-on icons to be modifiable, movable objects that the user can control. Since we can’t know what these icons will do nor launch, we can’t make decisions about their placement based on functionality. Why not gives users the ability to modify their placement, just as users can modify the bookmarks on their toolbar and the buttons on their UI? It seems inconsistent that we’ve been giving users easy control of so many objects in the Firefox UI, but not the placement of add-on icons. By treating add-ons as movable objects, we can modify the appearance of add-on icons based on where they’re placed in the UI. For instance, let’s assume an add-on icon by default displays in the bookmarks bar. It would then display as a regular 16 x 16 icon. However, if the user moves that add-on icon to the upper toolbar of the window, we could draw a border for it so that it has a consistent look with the other buttons in the toolbar. Moving it elsewhere, such as to the top of the window, would produce a different look. The user would then have the ability to modify their interface depending on how they use their add-ons. Next, incorporating add-ons that display more than an icon in the interface.